How to get L&R earbuds synced for first time use? 4.Find meidong in Bluetooth list and connect, phone connected. Done! Know more about the earbuds? 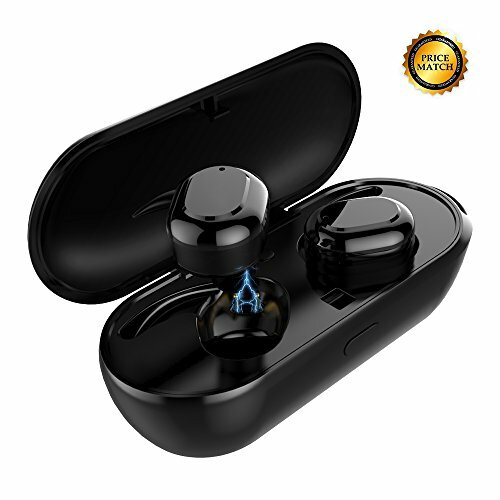 · Hear single mode when at work: single earbuds support to connect two smartphone at the same time when you are at work.if you have two smartphone, you can answer the phone via earbuds freely. 【Truly wireless for freedom】Equipped with classic CSR aptX bluetooth chips that makes music sound clear and powerful.True wireless design with uninterrupted Bluetooth streaming for total freedom of movement.No wires,no stopping you. 【Charge on the go】 Up to 3 hours of playing time with each charge and an additional 10 hours with the included on the go charging case, provide longer battery life than normal earbuds.Never worry about low battery when you are outside all day. 【Ergonomic Design,Anti-Drop】 Super lightweight and ergonomic design ensure comfort and secure for your ear.soft high quality rubber eartips of S/M/L fits your ear perfectly for r maximum comfort. Anti-sweating and Anti-drop out while running,hiking and exercising. 【Stable connection,Easy operation】 The TWS adopt latest bluetooth 4.1 technology to ensure stable connection and widely compatible with most of device such as iPhone, Samsung in 33 feet.And the big muti-functional touch control, hands-free calling through the left earpiece. Leave your phone where it is: just speak with a tap. 【More Skills?】 Activate Siri / Enjoy phone chatting / Press for next songs / Announce caller's phone number / Automatic turn off when not use/Magnetic charging/And more. Buy it now as it cover with 18 months extended warranty.